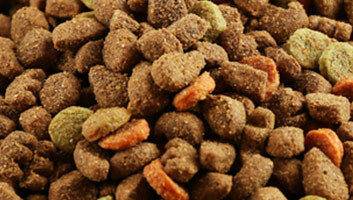 As a busy pet owner your schedule and your dog’s food schedule may not always be in perfect sync. Where this is the case an automatic dog feeder could be the answer. You can pre-program your normal feeding schedule and get on with your day with the peace of mind that your dog is not going hungry or being over feed by a helpful neighbor. But, there are many different types and brands of automatic dog feeder available, so how do you know which is the right one for your pet pooch. Here our team of pet experts and dog lovers have compiled a list of the best to help you make the right choice for you and your dog. 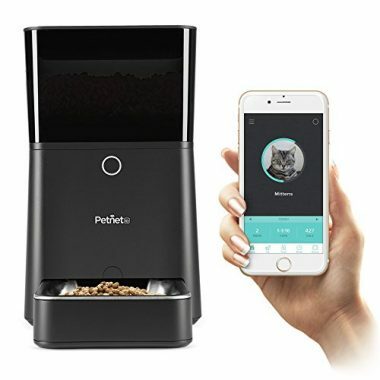 The Healthy Pet Simple Feed Automatic Feeder by PetSafe allows you to set a fully customize feeding schedule of up to 8 meals a day. You can manage portion size with ease and control the rate at which the food is dispensed. This is ideal if you have a dog that tends to gulp their food and then have problems with their digestion. The automatic feeder also has pause, slow and immediate feed modes, allowing you to meet the needs of your dog as they develop. It holds up to 24 cups of food and the translucent hopper easily allows you to see when food is running out. 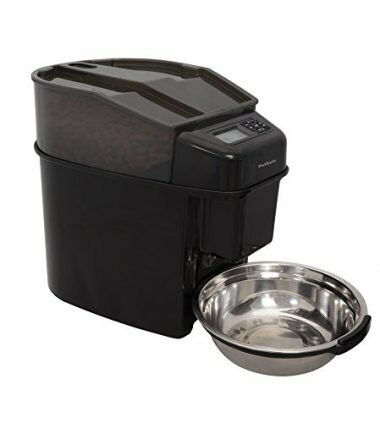 If you are looking for the perfect way to properly control your dog’s diet and portion size, then the Automatic Pet Feeder from Arf Pets could be the answer. It enables you to pre-program a feeding schedule of up to 4 meals a day, with between 1 and 10 portions of 24ml, in each meal. The meal alarm and message recorder allow you to let your pet know when it is food time, even when you are not there. The magnetic lid lock stops your pet from getting into the food dispenser, while the LCD screen ensures that the settings are exactly how you want them. Now you can add your pet feeder to the household technologies that you can run with your cellphone. The SmartFeeder from Petnet is designed to work with Amazon Alexa, so you can personalize your dog’s feeding times and portion size at the click of a button. The SmartFeeder can determine the right level of nutritional and calorie need of your dog based on their age, weight and their level of activity. As the owner you also get notifications of the meals that have been served, low food warnings, and the option to have food automatically ordered when needed. 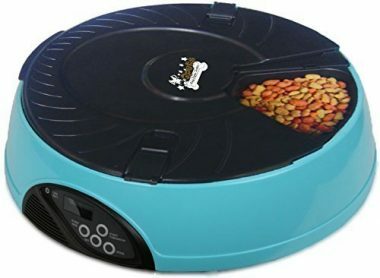 If you want to get your pet’s feeding cycle regular, but also want to be able to feed them wet food, then the QPets Automatic Pet Feeder is the perfect answer. The feeder has 6 individual feeding compartments that can be used over a 24-hour period. The locking lid keeps the other compartments safe until it is time for your dog to access them. Each compartment holds up to one cup of food. You can pre-set feeding times in advance and even leave a recorded message to let your dog know it is feeding time. 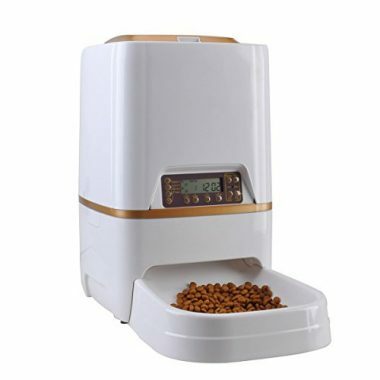 If you are looking for an easy to use automatic dog feeder, then the OUTAD Feeder could be just what you are looking for. The large LCD panel displays the current time, as well as showing the meals programmed, their size, and meals that have been served. The see-through hopper means that you always know just how much food is left, so you never run out. It also has a removable lid to make refilling it easy and mess free. 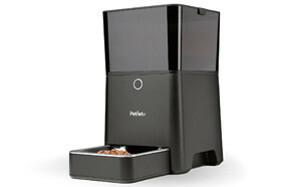 The pet feeder also has the capacity for you to record a message for your dog to let them know its feeding time. 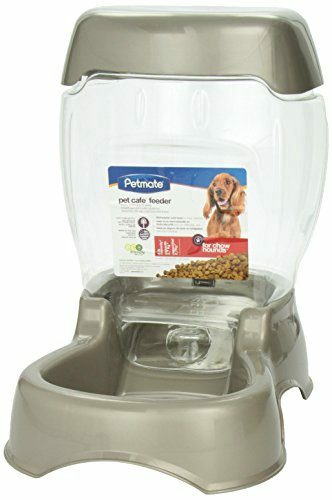 If you are looking for a simple answer to ensuring your dog always has access to the food they require, then the Petmate Pet Café Feeder may be the answer. As a gravity feeder it automatically replenished the food reservoir as the level reduces. The food storage hopper has an extra wide mouth to reduce the risk of blockages. It also has a removable lid to make refilling and cleaning it easy and mess free. 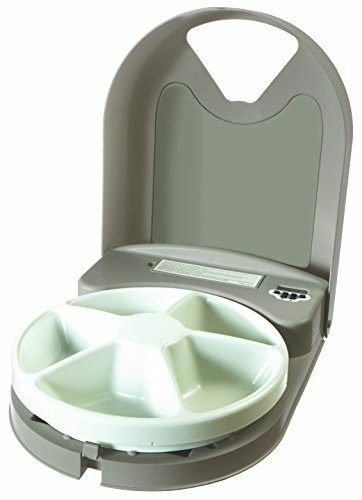 The 5-meal Automatic Dog Feeder from PetSafe is perfect to use at home, at the office, or while traveling with your pet. It enables you to pre-portion up to 5 small meals for use at intervals throughout the day. Fully programmable so that you decide when it opens and provides access for your pet pooch. The feeder is quick and easy to set up, and simple to use with its clear LCD display. The food tray is removable and is dishwasher safe. The Automatic Pet Feeder Food Dispenser from WestLink holds 6 liters of your dog’s favorite dry food. The programmable system means that you can pre-set up to 4 meals times a day and choose how many portions are released at each meal time. Each portion is around 10g, and up to 39 portions can be released in one sitting, making the system suitable for most sizes of dog. The built-in voice recorder means that you can record your own meal time call for your dog, so that they know their food is ready. Every dog has their own set routine and feeding requirements, which we as owners try to adhere to. However, when work, travel, or other things occur, this can be very difficult to maintain. Automatic dog feeders can be a superb addition to your home, supporting good routines and healthy eating habits, but it is essential to get the right one for you and your dog. Here our experts explore some of the key questions you should consider before buying an automatic dog feeder. Why Do I Need an Automatic Dog Feeder? 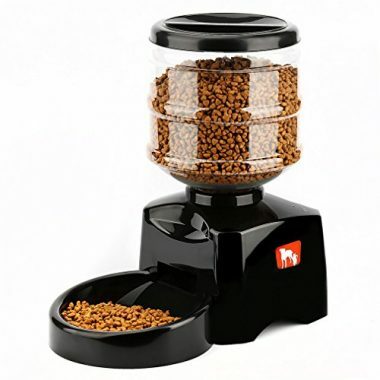 One of the main reasons to consider an automatic pet feeder is that it is convenient. You can plan your dog’s meals ahead of time and then get on with your day without worrying whether you have remembered to feed them or not. If you are late home from work, then your dog still gets feed on time. Similarly, if you want a lay in at the weekend, you can without your dog pining for their breakfast. As well as convenience, an automatic dog feeder can help control your pet’s weight. By setting the portion size to correspond to their age, size, breed, and energy requirements, you can ensure that you are not over or under feeding them. It also helps you to fully understand your dog’s eating habits over a period of time. Similarly, if your dog has digestive problems or tends to bolt their food, you can set the feeder to provider smaller portions more regularly. Maintaining your dog’s usual feeding routine, regardless of your routine. Ability to plan ahead and make temporary changes to normal feeding if required. Supporting healthy eating and suitable portion sizes. Ideal for feeding and monitoring the feeding habits of multiple dogs in the same home. Quick, easy, convenient, and generally mess free feeding and food storage. Allows you to see how much food is left and to plan your purchasing ahead of time. Both gravity and electronic pet feeders can benefit you and your pet. However, there are significant differences between the two that need to be explored. 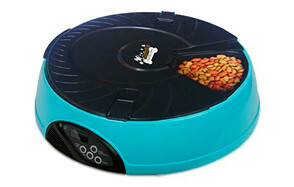 A gravity pet feeder, as the name implies works through gravity. Once the food in the feed bowl drops below a specific level, the feeder releases more food. Automatic feeders are pre-programmed to release a specific amount of food at a specific time. This can either be from a central hopper into a food bowl or by uncovering a new section of a food carousel at a specific time. Both types of dog feeders are convenient, ensuring that your dog has access to food when required. However, it is harder to plan ahead with a gravity feeder as your dog has constant access to food, rather than just meal time access. Maintaining a healthy weight for your dog is more difficult with a gravity feeder as your dog has constant access to food. If your dog’s weight is a concern, then an automatic feeder is the better option. However, if your dog prefers to graze throughout the day, then the gravity feeder ensures they have a constant supply of food. One of the difficulties of cleaning the gravity feeder is that the food bowl always has a supply of food within it. You would need to wait until the hopper was empty to clean it without the risk of spillage. Automatic feeders can easily be turned off or have their operations paused to allow for cleaning. If you are considering an automatic dog feeder then it is essential that you buy the best available for your pet. Here are some of the key considerations to keep in mind when choosing an automatic dog feeder. As well as the hopper capacity, you need to consider the minimum and maximum portion capacity of the feeder. These need to be within the range of what is a health portion size for your dog in any given sitting. You need to check the type of food that can be used in the feeder. Most accept dry kibble with no problems. But, if you prefer to feed moist or wet food, then your options may be limited to carousel type feeders. If you have multiple dogs in your home, will you need multiple feeders? If your dogs are competitive over food or display guarding behaviors over their food bowls, then the answer is yes. While most feeders are very durable and come with locking lids and other features to secure the food in the hopper, you do need to be aware of whether they can withstand an assault from your dog. Check to see the size and breed that the feeder is recommended for. Automatic dog feeders come with a wide range of programmable features. As a minimum you should be able to choose how many meals a day it provides and the size of those meals. 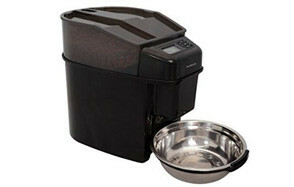 Check that the feeder offers a high enough number of meals to suit your dog’s needs. Other programmable features may include being able to pause feeding, monitor previous feeds, and create temporary feeding regimes without affecting the main programming. Is your pet used to you calling them when it is meal time? If they respond to a specific voice command, some of the best automatic feeders allow you to record messages for your dog to play at meal times. The average length of these messages is just 10 seconds, so nothing complex, but enough for your dog to know its dinner time. You can now purchase automatic dog feeders that connect to an app on your mobile phone or other devices. 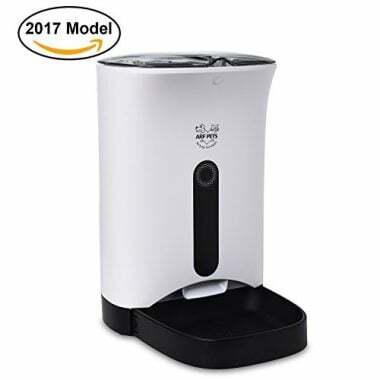 This enables you to monitor and make changes without needed to be in the same space as the feeder. This can be helpful if you have a compatible device, but this is something you should check before buying. No one likes leaving their pet pooch home alone, but sometimes it cannot be helped. Given this, we all want to know that our dogs are safe and happy when we are not there. So, what can we do as owners to ensure this is the case. One of the key things to do before you leave the house is ensure your dog has a safe space with access to everything they need. This is not the same as giving them free reign of the house, and where possible the space should be limited to a couple of rooms at most. This limits any damage that they might do and helps to make them feel more secure. Remove, or put out of their reach, anything they can damage or that could harm them. Where possible you should take them out for a walk or a play before you leave them alone. This helps to tire them out, meaning less energy to run around the home and bark at everything while you are gone. It also helps them to feel loved and therefore less likely to feel abandoned when you leave the house. If your dog is not used to being left, then expecting them to be okay with you being away for several hours is unrealistic. Start by leaving them for just a few minutes and build up over time so that they can see you always come home. Don’t forget to praise them when you return, especially if there is no mess or damage. If there is, then do not punish them, just give it a bit longer before you interact with them – maybe once you have cleared the mess or sorted out the damage. Make sure they have a toy to play with while you are out. Maybe a special toy that only comes out when you are going out so that it is a treat. Ensure it is not a toy that can be easily pulled apart or become a choking hazard in any way. Make sure they have access to food and water, and if you are going to be gone all day somewhere they can relieve themselves. If possible, get someone to check in on them during the day to break up their time along and let them out for a toilet break. By following these basic tips not only will you get the right automatic dog feeder for your needs, but you will have a dog that is better adjusted to spending time on their own.